The Navaratnas/Navratnas are the sacred nine gemstones as per Vedic texts and Indian Astrology that have a profound impact on human life. These Navratnas are linked to the nine planets also referred to as the Navagrahas and are recommended after the detailed study of the Kundali/ Indian Horoscope. 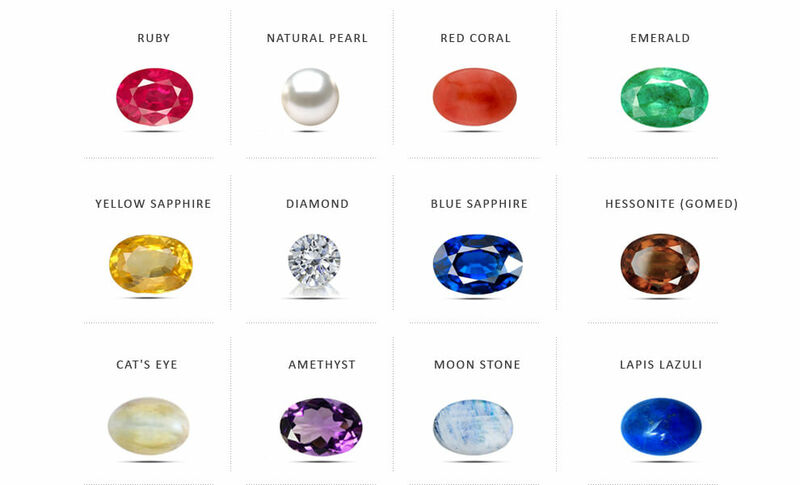 Combining the gemstones representing each of the nine planets in Vedic Astrology, the navaratna is considered the king of talismans, capable of attracting good fortune, auspicity and positive vibrations through its favorable influence on the planetary energies. One of the most sought after gemstones in the world are rubies. Rubies are made from Corundum. It should be noted that the mineral corundum creates two distinct gemstones, the first is the Ruby, the second being Sapphires. Sapphires come in a variety of beautiful colors, however only red Corundum is considered a Ruby. Ruby comes from the Latin word ruber which means red. The Ruby is one of the most beautiful gemstones created by nature. It comes in either a pinkish red or deep, rich red color. Rubies are perhaps one of the oldest known gemstones to man. They have been revered since the beginning of time and possessed for their beautiful qualities. Corundum, which Rubies are made from is created from aluminum, iron, small bits of chromium and titanium. It is usually written scientifically as Al2O3. It should be noted that Corundum is one of the hardest substances known to man and is second in hardness only to Diamonds. Ruby denotes energy, radiance, strength and intelligence. It bless one with drive, initiative, courage, administrative skills and supervisory powers. It bestows high honor and esteem, position and prestige on the wearer, and has a special quality to protect the wearer from harm. Pearls increases both inner and outer beauty, facial lustre and charm. It reduces tensions, creates mental balance, peace of mind, tranquility and calmness, enhances power of love and understanding. It is very good for memory, concentration & research, and is recommended for students and scholars. It keeps women and tensions under check and acts as a tranquilizer for an imbalanced mind. Coral is an interesting material, it is not a mineral or gemstone, in fact it doesn’t come from the earth’s crust, it is created from living organisms. Coral is an extremely interesting material that is hard, can have a smooth texture when polished and comes in a variety of very attractive colors. Coral is actually a form of calcium carbonate. You might be aware of calcium carbonate as it is the same type of material as marble or aragonite. Very small sea organisms called Coral polyps that live in the ocean in large colonies secrete these strands creating a habitat that protects them. Coral is a wonderful material that comes in many beautiful colors, most notably white, orange, black, pink or salmon which may be called angelskin and red. Coral has been known to man since ancient times and the word Coral comes from Greek, however the exact meaning is not known. Coral has always been popular as a material for jewelry, but has also been given qualities for mystical purposes. Properties Red Coral brings good fortune in life, prosperity in business or service, prestige in society. It blesses the wearer with financial stability, extra energy, strength and willingness to meet challenges and face critical situations. Red Coral brings good fortune in life, prosperity in business or service, prestige in society. It blesses the wearer with financial stability, extra energy, strength and willingness to meet challenges and face critical situations. One of the most popular and desired gemstone is the emerald. The Emerald is one of the earliest known gemstones and was adorned as ornamental jewelry for thousands of years. Emeralds have been known for at least 6,000 years and during Ancient times and the Middle Ages, were highly pursued. The Emerald is a gemstone made from Beryl, one of the more common minerals. Beryl is a mineral that has traces of beryllium which is necessary to create these wonderful hues. The Emerald is usually a dark, intense green, although it can come in lighter tones. It should be noted the darker, more intense the green, usually the more valuable and rare it is. Emeralds are caused by two elements found in the beryl, they are chromium or vanadium. It should be noted that an Emerald can occur with just the chromium, however most jewelers consider a true Emerald to have both elements present. Emerald is an extremely powerful stone, which blesses the wearer with power, strength and mental energy to make the most of a difficult and challenging situation. It makes one so creative, imaginative, bold, intelligent & enterprising that one is flooded with bright mind-boggling ideas and can form strategies and operations for the most prestigious project or organization. Yellow Sapphire One of the more colorful gemstones in the world are Sapphires. Sapphires are from the mineral Corundum and besides being extremely hard and strong stones; they come in a wide range of attractive colors. Some of the colors include colorless, yellow, green, orange, violet and gorgeous blue. Sapphires are formed from aluminum. They do however include many trace elements, usually precious metals which include iron, titanium, chromium and sometime lithium. Sapphires are usually found away from silica sand and rock. While many gemstones are created from silica, Corundum will only be found in poor silica environments which include cavities with pegmatite’s, alluvial and eluvia deposits and near hydrothermal volcano flows. A Yellow Sapphire Gemstone is a naturally occurring Gemstone, consisting basically of corundum (aluminium oxide), and tinged with slight traces of iron – the metal which leads to its beautiful yellow hue. Carving and cutting of the natural stone creates the brilliantly lit and cut gemstone that is one of the most valued of all precious stones. Yellow Sapphire blesses one with good luck and fortune, wealth & prosperity, valor and fame. It brings success and profits in business & industry promotions, raise and approbation in service, economic abundance, all comforts and luxuries in life. The Diamond is the best known gemstone and usually the most expensive. While it is not the rarest gemstone available, Diamonds are made from pure carbon, most were formed hundreds of millions of years ago deep within the earth’s crust. Most Diamonds were formed at a depth of about 100 miles and slowly have surfaced throughout the years. They tend to surface with lava flows and sedimentary veins. Diamonds were first found and used in India and the mention of Diamonds has shown up in writings dating back to 300 years BC. They were used as amulets and ornamental jewelry. Diamond is the King of all precious stones and considered most beautiful, durable and precious of all. It is one of the most powerful stones and shows very fast results. It brings good luck, success, fame, popularity, happiness and prosperity. The wearer of this beautiful gem stone is blessed with virtue and beauty on one hand, and energy, ambition, determination on other. It enhances social & professional image, helps one win approbation, acclaim & wide-spread fame, grants success in all ventures & helps in quick execution of plans, timely action & decisions. Ensure victory over rivals and enemies. Blue Sapphire one of the more colorful gemstones in the world are Sapphires. Sapphires are from the mineral Corundum and besides being extremely hard and strong stones; they come in a wide range of attractive colors. Some of the colors include colorless, yellow, green, orange, violet and gorgeous blue. A Blue Sapphire is a naturally occurring gemstone composed of corundum (aluminum oxide), and tinged with slight traces of cobalt and some other metals which lead to its beautiful blue hue. In fact, the word 'sapphire' itself means 'blue stone'. A Blue Sapphire Gemstones has considerable sparkle and might display different colours when viewed from different angles. Sapphires can be heat treated, diffused with beryllium or irradiated to preserve and enhance their blue brilliance – but the naturally occurring sapphires are still the most valued. Blue Sapphires Gemstones can also have secondary hues like violet and purple. Blue Sapphire is an extremely powerful stone, which can do as much harm as good. If it proves conducive for a person, it can bless one with immense good luck, wealth and prosperity and grant unexpected riches and sudden financial gains. It can create a drastic upswing in business gains and profits and change the entire life pattern of a person, for good. It is the most typical of all gems and stones. Hessonite is imperative for those suffering from malefic effects of Rahu. Malefic of Rahu increases mental tension and makes one angry and annoyed over small matters. One lacks decision making power and is always lost in day dreams and flights of fancies. Most of one’s plan meet with the failure. The cat’s eye is usually referred to the illusion that a Precious Gemstone or mineral can give, however some Gemstones and Minerals use the term Cat’s Eye interchangeably. mainly Cat’s Eye is found in Quartz, as well as Chrysoberyl and Beryl, among other species of Precious Gems. The stone is also known by many other names, as Lehsunia, Vaiduria, Cymophane and Chrysoberyl. Abundantly, the Cat's Eye Gemstone is found in Honey color, Yellowish Green and Black, however, there are many other shades to the Gemstone. this Gemstone comes is various Colors and Black Cat's Eye stone has similar impact as the other colors.the Word Cat’s Eye was taken from the old European Word Querklufterz, which means Croos Vein ore in Saxon. Cat’s Eye removes hurdles & hindrances from a person’s life and negative planetary influences - this stone clears all obstacles and helps one to move ahead in life. It protects one from unforseen losses in business and profession and ensures financial stability by guarding owner’s wealth & helping in accumulating more. It acts as guardian of wealth. It can bestow sudden wealth & riches from speculation, gambling, racing, stocks and investments. .